1 كغ | كيلوغرام 2011 من العملات الفضية الخاصة بالكوالا الأسترالية This design continues the tradition of the Perth Mint Koala silver coin. 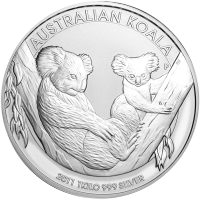 This perennial favourite is one of the most popular designs by the Perth Mint and features one of Australia's most lovable creatures in various poses and aspects of its habitat. The reverse of this issue is an image of an adult and baby koala relaxing on a tree limb. The details of both the tree limb and the Koala's fur, along with the attention to detail of this design make it the perfect addition to any collection.